Mirjalili, M., Ayyari, M., Bakhtiar, Z., Moridi Farimani, M., Sonboli, A. (2016). Quantification of betulinic, oleanolic and ursolic acids as medicinally important triterpenoids in some Thymus species from Iran. 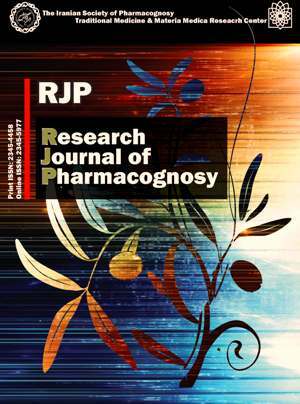 Research Journal of Pharmacognosy, 3(1), 23-28. M.H. Mirjalili; M. Ayyari; Z. Bakhtiar; M. Moridi Farimani; A. Sonboli. "Quantification of betulinic, oleanolic and ursolic acids as medicinally important triterpenoids in some Thymus species from Iran". Research Journal of Pharmacognosy, 3, 1, 2016, 23-28. Mirjalili, M., Ayyari, M., Bakhtiar, Z., Moridi Farimani, M., Sonboli, A. (2016). 'Quantification of betulinic, oleanolic and ursolic acids as medicinally important triterpenoids in some Thymus species from Iran', Research Journal of Pharmacognosy, 3(1), pp. 23-28. Mirjalili, M., Ayyari, M., Bakhtiar, Z., Moridi Farimani, M., Sonboli, A. Quantification of betulinic, oleanolic and ursolic acids as medicinally important triterpenoids in some Thymus species from Iran. Research Journal of Pharmacognosy, 2016; 3(1): 23-28. 1Department of Agriculture, Medicinal Plants and Drugs Research Institute, Shahid Beheshti University, G. C., Tehran, Iran. 2Department of Horticultural Science, Tarbiat Modares University, P.O. Box 14115-365, Tehran, Iran. 3Department of Phytochemistry, Medicinal Plants and Drugs Research Institute, Shahid Beheshti University, G. C., Tehran, Iran. 4Department of Biology, Medicinal Plants and Drugs Research Institute, Shahid Beheshti University, G. C., Tehran, Iran. Background and objectives: Betulinic acid (BA), oleanolic acid (OA) and ursolic acid (UA) are well-known pentacyclic triterpenoids (PTs), which are produced by plants. They possess a variety of beneficial effects including anti-inflammatory, hepatoprotective, antitumor, anti-HIV, antimicrobial, gastroprotective, and antihyperlipidemic activities. In the present study, quantitative determination of these compounds was simultaneously carried out in some Thymus species native to Iran i.e. T. daenensis, T. pubescens, T. persicus and T. caramanicus. Methods: Lyophilized and powdered plant material (1.0 g) was drenched in MeOH and immediately sonicated at room temperature. The methanol extract was further separated into organic and aqueous layers. The organic layer was dissolved in HPLC grade methanol, filtered and analyzed by reverse-phase HPLC. Results: The maximum content of BA, OA and UA were determined in the aerial parts of T. persicus as856.9, 480.6 and 941.7 mg per 100 g dry weight (DW) of plant, respectively while the other Thymus species had an almost negligible amount of these compounds. Conclusion: Results showed that the aerial parts of T. persicus could be a considerable source of these PTs which might be attractive for future phytochemical and biological investigations according to importance of their health benefits. Govindarajan R, Sreevidya N, Vijayakumar M, Thakur M, Dixit VK, Mehrotra S, Pushpangadan P. In-vitro antioxidant activity of ethanolic extract of Chlorophytum borivilianum. Nat Prod Sci. 2005; 11(3): 165-169. Petronelli A, Pannitteri G, Testa U. Triterpenoids as new promising anticancer drugs. Anticancer Drugs. 2009; 20(10): 880-892. Martin VJJ, Pitera DJ, Withers ST, Newman JD, Keasling JD. Engineering the mevalonate pathway in Escherichia coli for production of terpenoids. Nat Biotechnol.2003;21(7): 1-7. Liu J. Pharmacology of oleanolic and ursolic acid. J Ethnopharmacol. 1995; 49(2): 57-68. Liu J. Oleanolic acid and ursolic acid: research perspectives. J Ethnopharmacol. 2005; 100(1): 92-94. Ghaffari Moghaddam M, Ahmad FBH, Samadzadeh-Kermani A. Biological activity of betulinic acid: a review. Pharmacol Pharm.2012; 3(2): 119-123. Pertino MW, Lopez C, Theoduloz C, Schmeda-Hirschmann G. 1,2,3-Triazole-substituted oleanolic acid derivatives: synthesis and antiproliferative activity. Molecules. 2013; 18(7): 7661-7674. Farina C, Pinza M, Pifferi G. Synthesis and anti-ulcer activity of new derivatives of glycyrrhetic, oleanolic and ursolic acids. Farmaco. 1998; 53(1): 22-32.
 de Oliveira BH, Santos CAM, Espindola APDM. Determination of the triterpenoid, betulinic acid, in Doliocarpus schottianus by HPLC. Phytochem Analysis. 2002; 13(2): 95-98. Zhang Z, ElSohly HN, Jacob MR, Pasco DS, Walker LA, Clark AM. New indole alkaloids from the bark of Nauclea orientalis. J Nat Prod. 2002; 64(6): 1001-1005. Neto CC. Cranberry and its phytochemicals: a review of in vitro anticancer studies. J Nutr. 2007; 137(1): 186-193. Ayatollahi AM, Ghanadian M, Afsharypour S, Abdella OM, Mirzai M, Askari GH. Pentacyclic triterpenes in Euphorbia microsciadia with their T-cell proliferation activity. Iran J Pharm Res. 2011; 10(2): 287-294. Khan S, Kazmi MH, Ahmed E, Malik A, Sharif A. Phytochemical Studies on Sorbus cashmiriana. J Chem Soc Pakistan. 2013; 35(1): 130-134. Begum S, Siddiqui SBS, Khatoon R, Aftab F. Phytochemical studies on Syzygium aromaticum Linn. J Chem Soc Pakistan. 2014; 36(3): 512-516. Mendes E, Marco JL, Rodríguez B, Jimeno ML, Lobo AM, Prabhakar S. Diterpenoids from Salvia candelabrum. Phytochemistry. 1989; 28(6): 1685-1690. Tezuka Y, Stampoulis P, Banskota AH, Awale S, Tran KQ, Saiki I, Kadota S. Constituents of the Vietnamese medicinal plant Orthosiphon stamineus. Chem Pharm Bull. 2000;48(11): 1711-1719. Tan N, Kaloga M, Radtke OA, Kiderlen AF, Oksuz S, Ulubelen A, Kolodziej H. Abietane diterpenoids and triterpenoic acids from Salvia cilicica and their antileishmanial activities. Phytochemistry. 2002; 61(8): 881-884. Ali MS, Ibrahim SA, Jalil S, Choudhary MI. Ursolic acid: a potent inhibitor of superoxides produced in the cellular system. Phytother Res. 2007; 21(6): 558-561. Silva MGV, Vieira IGP, Mendes FNP, Albuquerque IL, dos Santos RN, Silva FO, Morais SM. Variation of ursolic acid content in eight Ocimum species from northeastern Brazil. Molecules. 2008; 13(10): 2482-2487. Razboršek MI, Voncina DB, Dolecek V, Voncina E. Determination of oleanolic, betulinic and ursolic acid in Lamiaceae and mass spectral fragmentation of their trimethylsilylated derivatives. Chromatographia. 2008; 67(5):433-440. Bakhtiar Z, Mirjalili MH, Sonboli A, Moridi Farimani M, Ayyari M. In vitro propagation, genetic and phytochemical assessment of Thymus persicus – a medicinally important source of pentacyclic triterpenoids. Biologia. 2014; 69(5): 594-603. Jalas J. Thymus. In: Flora Iranica, Vol 150, K. H. Rechinger Ed., New York: Springer, 1982. Srivastava P, Chaturvedi R. Simultaneous determination and quantification of three pentacyclic triterpenoids-betulinic acid, oleanolic acid, and ursolic acid-in cell cultures of Lantana camara L. In Vitro Cell Develop Biol Plant. 2010; 46(6): 549-557. Wang H, Wang Z, Gio W. Comparative determination of ursolic acid and oleanolic acid of Macrocarpium officinalis (Sieb. et Zucc.) Nakai by RP-HPLC. Ind Crop Prod. 2008; 28(3): 328-332. Jäger S, Trojan H, Kopp T, Laszczyk MN, Scheffler A. Pentacyclic triterpene distribution in various plants-rich sources for a new group of multi-potent plant extracts. Molecules. 2009; 14(6): 2016-2031. Zhang W, Men X, Lei P. Review on anti-tumor effect of triterpene acid compounds. J Cancer Res Therap. 2014; 10(5): 14-19. Radwan AA, Alanzi FK. Design and synthesis of new cholesterol conjugated 5-Fluorouracil: A Novel potential delivery system for cancer treatment. Molecules. 2014; 19(9): 13177-13187. Hanover JW. Applications of terpene analysis in forest genetics. New Forests. 1992; 6(1): 159-178.